Lotto Balls, Cleveland, Uncle Drew, & Wine Colored Bow Ties ~ Roundball Manor - The House that Basketball Built. Now it sounds like a party. The Cleveland Cavaliers came away with the number one selection last night, winning their second lottery since the departure of LeBron James in 2010 and their fourth in franchise history. The Cavs looked poised to take big man Nerlens Noel, adding him to a solid young core of Kyrie Irving, Dion Waters, Tristan Thompson, and Tyler Zeller. Nerlens Noel appears to be Anthony Davis 2.0, and elite big man who can alter the game with his defense and shot blocking abilities. Once he develops his offensive game he should be a foundation on that team for years to come. There were some questions after the lottery as to what Clevelend will do with the number one pick, as they currently have three other picks (19,31 & 33) as well as a team of young stars with favorable contracts. If they select Noel, they would create a logjam down low with Anderson Varejao, Tyler Zeller and Tristan Thompson all fighting for minutes. But remember, Nelens will miss most of the year recovering and Varejao missed most of last year with injury, so depth down low is never a bad thing with young bigs. Tyler Zeller is an improving big man who will work into the rotation, but not sure he'll ever amount to a star. They're still waiting on Tristan Thompson to take off his huggies and get after it. (He would only be a college senior next year, so the jury is still out) Anderson Varejao is a solid defensive big man right now and could become a great trade commodity down the stretch next season if they get good production out of Zeller, Thompson, and Noel. They could dump his 9 million dollar salary and scoop up another draft pick. The Cavaliers are in a good position to build a solid roster for the next several years, putting the right pieces around Kyrie Irving and getting back to the playoffs. 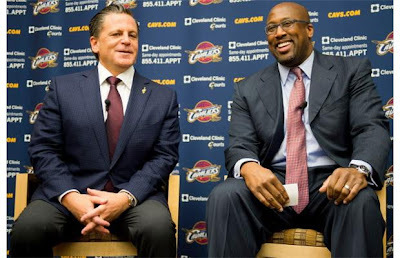 If Dan Gilbert doesn't want Kyrie to pull a LeBron 2.0 in 3 years, he has to use his resources and build a foundation for a winning team THIS YEAR, and they seemed poised to do just that. "Hey didn't you fire me last time?" "Shutup and smile." Wow- A roster breakdown on the CLEVELAND CAVALIERS in the midst of the Conference Finals. That just happened.